Singapore’s first theme park, ‘Haw Par Villa’, was known as ‘Tiger Balm Gardens’ when it was opened in 1937 by the Haw par brothers who created Tiger Balm ointment. The car park attendant on the gate looked as if he had been there since that time as he shakily handed over a hand-written ticket in exchange for a five dollar note. The grounds of the park contain hundreds of statues, models and dioramas depicting scenes from Chinese mythology. Some of the concrete models are faded and weathered but one or two are being given a fresh coat of paint. 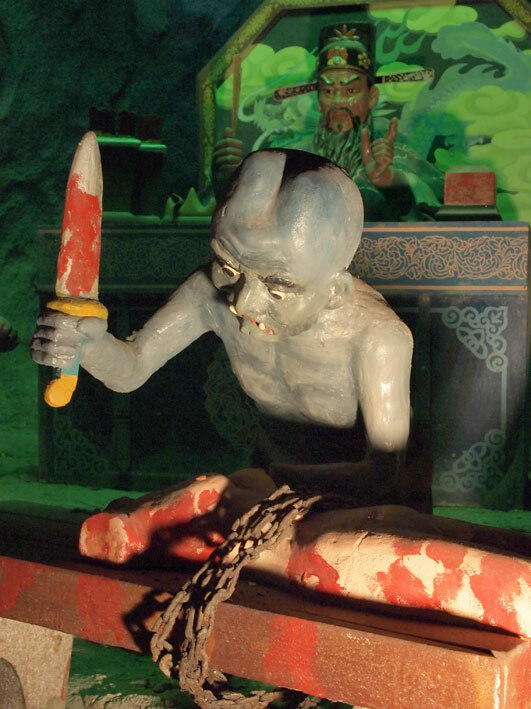 The scenes depicting the ‘10 Courts of Hell’ inside a dragon’s tail were perhaps the most intriguing with models of gruesome punishments being dealt to sinners in purgatory on their way to the afterlife. Preliminary trials are conducted in the First Court from where prisoners are judged to be good or evil. Those who have lead virtuous lives travel over the Golden or Silver Bridge to paradise. The evil are sent to repent before the ‘Mirror of Retribution’ before being taken to the appropriate Court to be punished for their crimes. Such crimes include murder, robbery, fraud, tax dodging, lack of filial piety (respect for parents), disrespect for elders, ungratefulness, money lending at exorbitant rates, cursing, misuse of books, breaking written rules and regulations, and wasting food. There was no crime listed for ‘deliberately blocking the space in front while driving to prevent someone in front changing lanes’. There should be. The impressive villa has gone but the garage provides an insight into the lifestyle of the flamboyant brothers who peddled their wares in an orange and black car decorated with a tiger’s head over the radiator and a horn that resembled the animal’s roar. 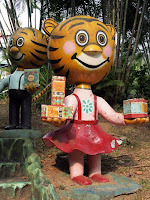 Tiger Balm Gardens must have been impressive in its day, but the cheesy, outdated park is of little interest to modern Singaporeans as it does not fit on an iPhone screen. 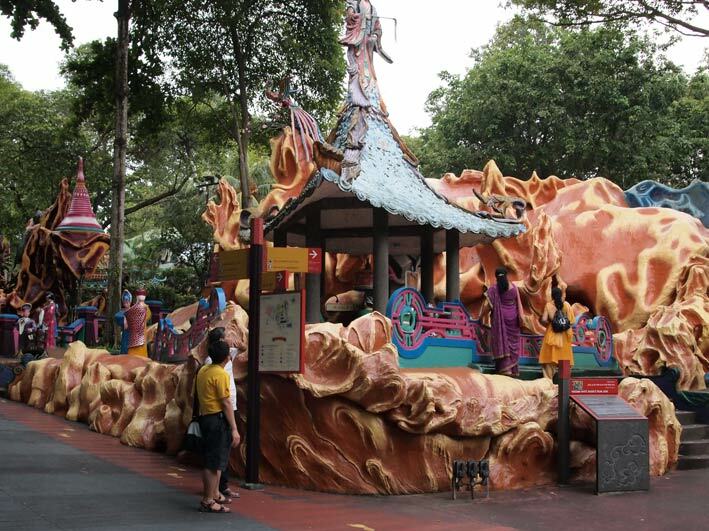 Haw Par Villa provides an insight into the history and culture of Singapore. If I had to choose between the park or its modern equivalent of Sentosa, I think I know which one I’d choose.